Ashley Horner was always into fitness when she was younger. She was brought up on a ranch with horses and took part in gymnastics throughout her youth. It wasn’t until Ashley had her son that things started to change. She gained and extra 45lbs and started to lose touch with fitness. Making the decision to change her life and get her body back to optimum health, she began training for her first competition. Needless to say, Ashley went on to win her first and numerous other competitions. She’s now a top fitness model, personal trainer, and inspiration for million everywhere. Ashley Horner first got involved with fitness when she was in high school. She had always lived a healthy life ever since she could remember. Ashley played soccer and enjoyed years of gymnastics. She remembers seeing her mom slowly changing her lifestyle to be more health orientated, and in the process, it started to change Ashley’s approach to fitness. After getting married and having her son, she gained an additional 45lbs through the pregnancy. However, before her pregnancy she was adamant she’d always stay fit, lean and healthy, unfortunately for Ashley, this wasn’t the case. Looking after her newborn son was a full-time job, she remembers not showering for days and feeling horrible. From this point onwards she knew she had to make a change and turn things around. Ashley committed to herself to train and prepare for her first figure competition which was held in Cape Cod America. The competition was being held on the 19th of April 2008. She contacted someone in her local area who knew about fitness and competition prep. Little did Ashley know at the time, but this person was to change her life forever. Rhonda Finlayson was her name, and she taught her everything she could have dreamed of. Diet, nutrition, and everything to do with competition preparation. It wasn’t long until her body started to change dramatically. She saw her arms getting bigger, her legs and abs all started to take shape. All of the hours in the gym and eating nutritious food paid off. Ashley won her first competition and has gone on to compete in numerous others since her first win. Ashley admit, she never liked doing cardio that much, she says, she’s more of a “weights junkie”. When she knows it’s time to do cardio. she’ll try and swim in the ocean, go rock climbing or a quick HIIT session. Walking lunges with 45-pound plate over my head 100x 4 sets of 25. Squat rack 95 pounds 15x I always go deep with great form to hit the glutes. Skull crusher’s barbell 25 pounds. LA at the Iron man convention. Ashley always likes to eat as clean as possible, including in the off-season. In Ashley’s eyes, it’s a full-time job and doesn’t let one aspect of her training slip, especially her diet. She’ll follow a Paleo type diet most of the time. She likes to add cream in her morning coffee and will have protein shakes throughout the day. Ashley says she likes to eat fish, including raw tuna. She also likes to eat nuts, fresh berries, and all animal proteins. Her first modeling inspiration came from seeing Amanda Adams. 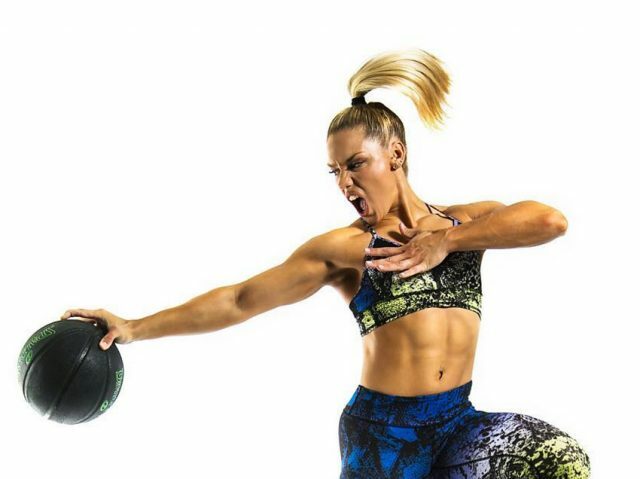 In Ashley’s eyes, Amanda is “exactly what a fitness model should be”. Ashley also mentioned Ava Cowen’s physique as another inspiration of hers. Ashley had been bitten by the fitness bug years before she got into modeling. Her love for sports and a healthy lifestyle in her early years helped her to realize the importance of keeping active and strong. However, she faced a road block after the pregnancy of her son. She gained 45 lbs and was slipping downhill. This just shown that when her spirits were down faced with a long and difficult road ahead, she got herself back to fighting fit and feeling 100% again. Ashley just wanted to say that you are amazing. going to use your work out and meal plan and let you know how I am doing. Keep killing it!!! !